Last weekend, my mother, sister and cousin came up to Toronto for a visit and to celebrate my cousin’s 19th birthday. We had a full day of shopping on Queen Street west, where I found the gorgeous scarf I posted about a few days ago. That night we decided we all wanted to go out. We thought we were going to go to a jazz club but once we realized how busy it was going to be, we ended up at a salsa lounge. The lounge ended up being the perfect choice. There was a live band, a lot of dancing, some fantastic drinks and a night filled with laughs. I did not have a lot of time to get ready, so I kept the outfit simple. 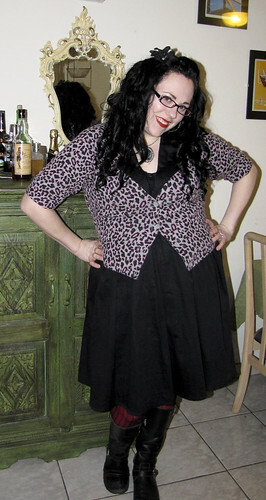 I pulled out my sleeveless black dress from eShakti since I had ironed it a few days ago but never wore it and I paired it with a new grey and pink leopard print cardigan I just got in from Torrid. I decided to play up the pink in the cardigan by layering a pair of fishnets over my “Scarlett” tights from We Love Colours. According to the site these tights are supposed to be red but they are most definitely fuchsia. I would still love to find a pair of nice red tights, but now I have no idea what colour I should try. 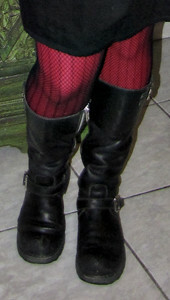 For my shoes, I knew I wanted a pair of boots so the tights would not be too overwhelming. I opted for my Fluevog bondgirls which I knew would be comfortable all night long. I ended up taking off the sweater half way through the night, which meant I just had on my dress for a while. I have to say, paying the extra $15 to make this dress sleeveless was one of the best decisions I made. I think it has made it really versatile when it comes to layering, and it also let’s me show off my tattoo. Now that I had my final tattoo session yesterday, I am certainly going to want to wear more sleeveless dress once the warmer weather hits. I LOVE your Fluevogs. What style are they? Do you mind me asking what your calf measurement is? What is not to love about Fluevogs! 😉 These are the Bondgirl’s and I adore them! I measured my calf a while ago and I have 16 inch calves but I measured over top a pair of skinny jeans and tights so they might be a tad smaller, but I can wear the boots zipped up over top of them. When I first bought the boots, I had them stretch it out at the Fluevog store (which takes about a week) and they can stretch it a full inch. That cardigan looks SO MUCH BETTER on you than it does on me !!! As always, I am jealous of you & how gorgeous you are & how everything looks AMAZING on you !!! !